There's nothing quite like being away from your card collection for a year to really put things into perspective about what is important and what isn't. Since returning to America, I have successfully cut my collection roughly in half with many of them going to a lucky young collector in Osseo, WI. I'm planning on giving away some more of my cards during a giveaway in a short while when Heartbreaking Cards surpasses half a million visitors...we are sitting at roughly 496,000 currently so it should be next week sometime I would imagine. More on that later though. 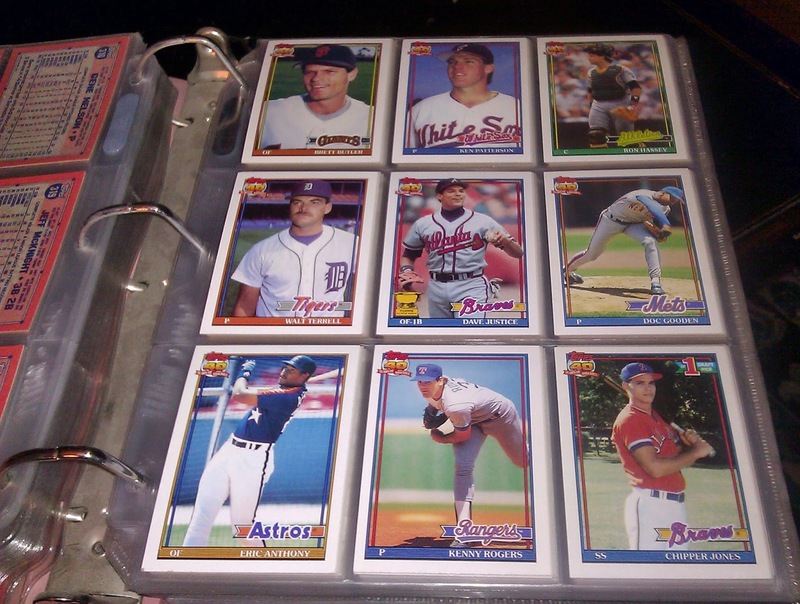 So as I was trying to consolidate my collection to only those cards that I really appreciate, my parents dropped off this binder of cards they found in my old childhood closet at their house. 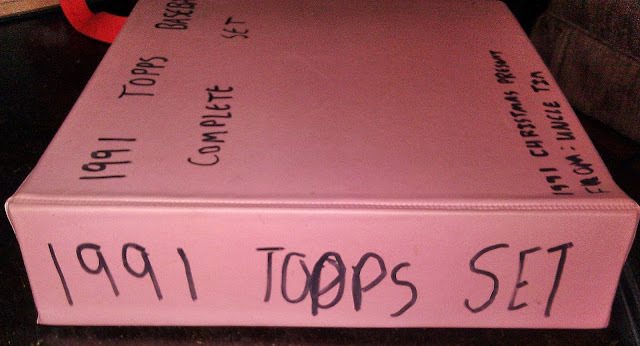 As you can see, the binder tells you exactly what was waiting inside for me. Also spelling didn't seem to be a priority...apparently as I kid I would put my "1991 TOOPS SET" into anything including hot pink binders. 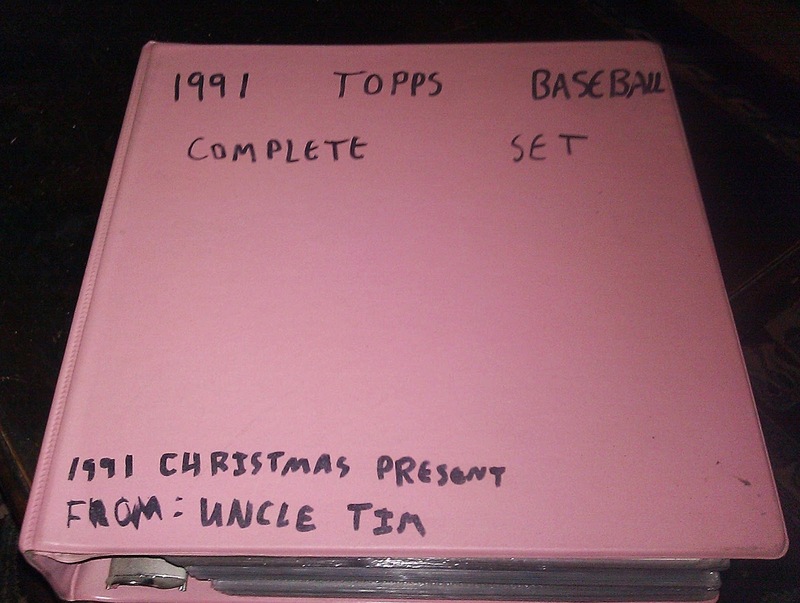 As I wrote on the front cover this set came to me from my Uncle Tim who would regularly give me baseball card sets and packs for the holidays when I was younger and he really got me interested in card collecting. Here's the first page of the set celebrating Topps 40th anniversary in making cards. I love that horizontal Nolan Ryan #1 card. As I flipped through I noticed that a few of the cards were missing and so I must have pulled what I thought were the best cards out of the set to stare at longingly in 1992. So let's see if the actual best card in the set is still there. 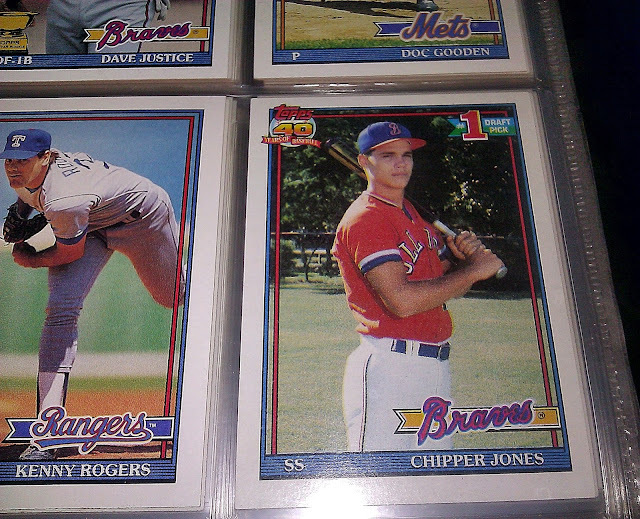 Sure enough, 12-year-old me never gave Chipper Jones rookie a second glance. I'm always happy to add another one of these to my collection. Oh, it's PINK. I thought it was some kind of crazy lighting. Who has a pink binder? A Pepto Bismol sales rep? Hello Kitty's card collecting cousin? Real men keep their cards in pink binders. Or something like that.